Personally created wall hung glass art and glass art bowls. • Wall-Hung Glass art, Single panels to 500mm. Triptych 3 panels all sizes from 100mm to 500mm each. • The surface of the glass can be made to be curved or flat. • Each wall-hung panel can be attached directly onto your wall with the professional glass fixings provided. 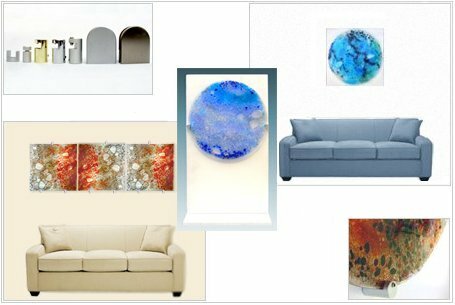 • Alternatively, the glass panel(s) can be mounted onto a board and hung like a painting. • Mounted onto a L shape stand to display glass in a niche (see ING Bank image). Note: Boards are not needed unless you have busy wallpaper. • Any source of light directed onto the surface of the glass will enhance its appearance and show the changing colours of the dichroic glass and reflective lenses. • Back lighting - Not necessary, but a light box can be made P.O.A. • Each wall-hung panel can be attached directly onto your wall with the professional glass fixings. The turnaround time for making Glass depending on complexity usually 2- 6 weeks. 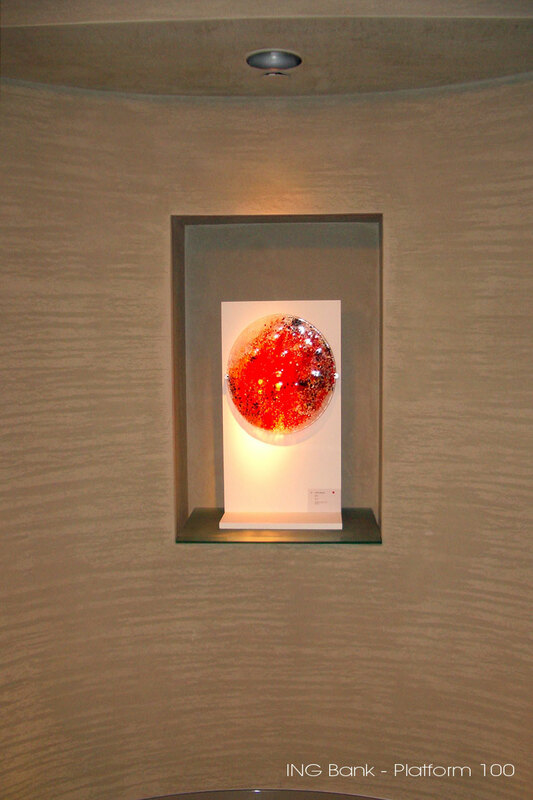 • Art Glass Panels (Bullseye Glass) to size 500mm (larger by special order). • Triptych’s centre panel 500mm, (2) side any size to 500mm - (500mm + any size to 500mm). • Art Glass. I use 500mm x 500mm, but the maximum size - 600mm x 800mm by commission. • Float glass, (Green tinged) I do not use this glass as the colours are dull & the variety of colour and types of glass limited. Smaller works start at: £150. +P.O.A. Larger sizes: £250.00 + P.O.A. To make an enquiry about a Glass design, please contact us.